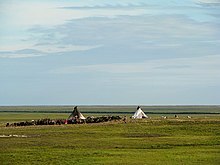 Tundra tends to be windy, with winds often blowing upwards of 50–100 km/h (30–60 mph). However, in terms of precipitation, it is desert-like, with only about 15–25 cm (6–10 in) falling per year (the summer is typically the season of maximum precipitation). Although precipitation is light, evaporation is also relatively minimal. 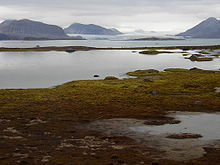 During the summer, the permafrost thaws just enough to let plants grow and reproduce, but because the ground below this is frozen, the water cannot sink any lower, and so the water forms the lakes and marshes found during the summer months. There is a natural pattern of accumulation of fuel and wildfire which varies depending on the nature of vegetation and terrain. Research in Alaska has shown fire-event return intervals (FRIs) that typically vary from 150 to 200 years, with dryer lowland areas burning more frequently than wetter highland areas.